This one pot chicken with tomato basil risotto is the perfect weeknight meal – the whole thing bakes in the oven in a single dish! 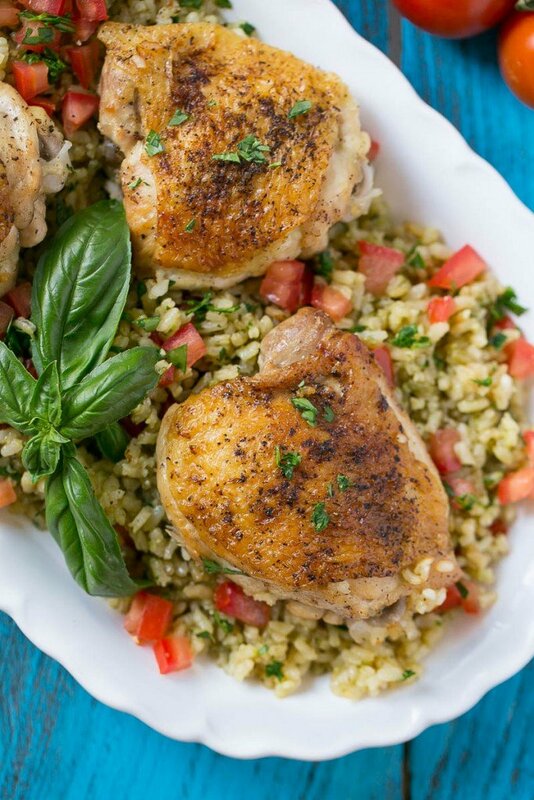 Chicken thighs are paired with creamy pesto rice for an amazing flavor combination the whole family will love. 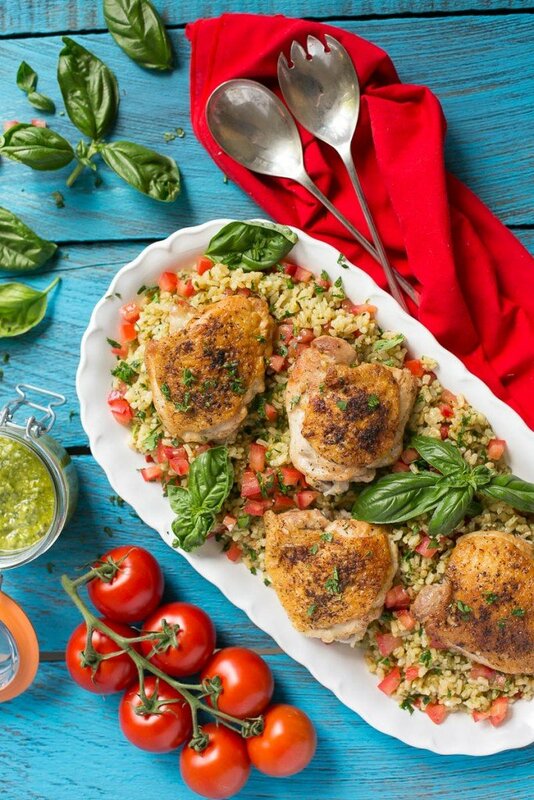 Chicken thighs with rice is comfort food at its finest – this version is an Italian spin on the dish with a tomato basil rice that’s fresh and vibrant. Yes, it’s one pot meal time again! This time I’ve got a one pot chicken with tomato basil risotto. I love risotto but I just don’t have the time to stand there and stir it forever. This risotto actually bakes in the oven with the chicken and the tomato and basil flavorings get stirred in at the very end. 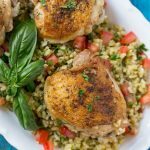 How do you make one pot chicken with risotto? I used bone-in chicken thighs for this dish because I really think they’re one of the best candidates for a one pot meal. The bone-in chicken thighs consistently come out moist and tender after being baked in the oven, which is important because no one likes dry chicken. I find that it’s so much easier for me to put a meal in the oven rather than stand at the stove top and watch over pots. I have three very active kids (including a somewhat mischievous 2 year old) and when I’m busy literally watching pots boil I tend not to notice other things…like when a certain mischievous 2 year old removes the child lock from the baking cabinet, grabs a gigantic tub of sprinkles, takes her prize to the family room and accidentally dumps it all into the carpet. When dinner is baking in the oven, all I have to do is set a timer and walk away. For this dish, the chicken and rice bake together in the oven with a little onion and chicken broth. I use a short grain rice which makes the end product similar to risotto but with no stirring involved. At the very end when the chicken and rice are cooked through, I stir in some pesto, fresh tomatoes and parmesan cheese. Adding the flavorings at the end really preserves the fresh flavor of the pesto and tomatoes. I almost always use store bought pesto – I’ve never had any luck growing basil in any large quantity and the fresh pesto they sell at Costco actually takes almost homemade. This is a great dish to make on a busy weeknight but looks fancy enough to serve for company. You can serve it as is or add a salad to round out your meal. Either way, it’s an amazing one pot delight that will appeal to everyone – I got thumbs up all around the table! 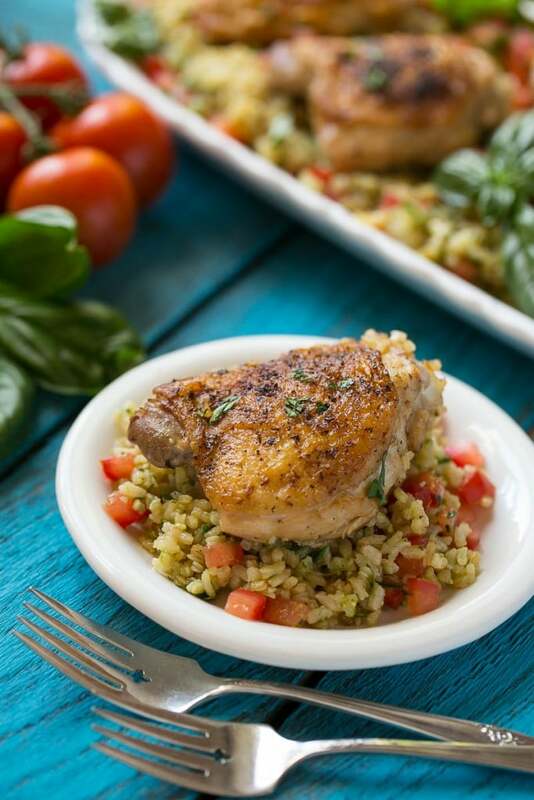 This one pot chicken with tomato basil risotto is a complete meal that the whole family will enjoy. In a large skillet, heat the olive oil over medium high. Sprinkle the chicken thighs with the italian seasoning as well as salt and pepper to taste. Place the chicken in the pan skin side down, cook for 5-6 minutes or until deep golden brown. Flip the chicken and cook on the other side for another 5 minutes or until golden brown. Remove the chicken from the pan and cover. Add the onion into the pan, cook for 4-5 minutes or until translucent. Add the rice and cook for another 2 minutes. Pour the white wine into the pan, turn up the heat to high and cook until the wine has evaporated. Add the chicken broth and 1/2 teaspoon salt to the pan. Return the chicken to the pan and bring the liquid back to a boil. Cover the pan and place it in the oven. Bake for 40 minutes. Remove the chicken from the pan. Add the pesto, tomatoes and cheese to the rice and stir to combine. Add more salt and pepper if needed. Put the chicken back on top of the rice and serve. Sounds delicious! Is there any particular white wine you’ll recommend? No brand in particular, just choose one you’d enjoy drinking! This chicken is the best! I love chicken and rice, and one pot chicken and rice is even better. I added a little extra tomato and it was great. This is the best looking one pot recipe I’ve seen. I love that you’re still going through the proper steps of searing the chicken and softening the onions. Looks so relish. I love one pot meals, and this one looks like a real winner! I know my husband and I would absolutely love this – adding it to the menu for this fall! You would never know this was all cooked together in one pot! It’s gorgeous and looks so delicious! Risotto in the oven? Yes please! I never thought of that. I love that you still use the white wine! Can’t wait to try this one. PS these photos are seriously gorgeous. I love that you’ve made a one dish meal with risotto. This is definitely going on my must-make list! Pinned! One pot meals are the best! This one is definitely going on the fall menu…it looks delicious! Pinning! One pot meals are a lifesaver. 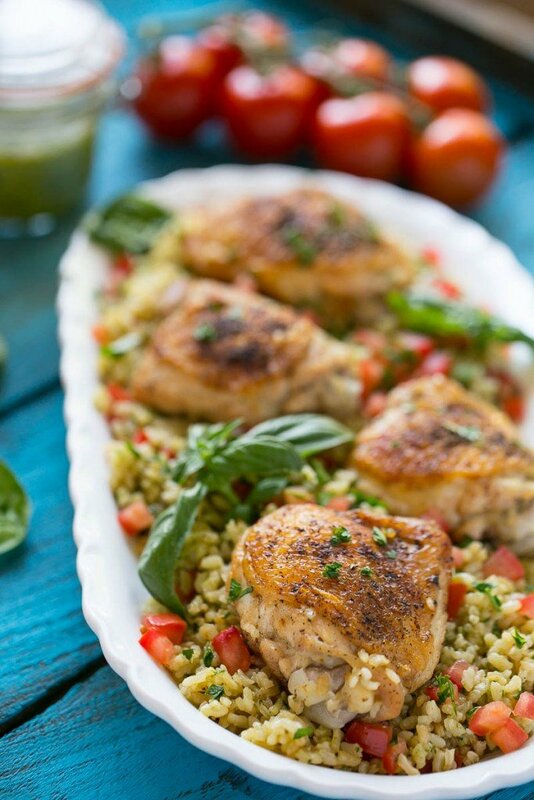 That tomato basil risotto is such a great addition to a weeknight chicken dinner. This looks amazing! I love one pot meals…great for keeping the kids out of trouble when trying to cook! I adore risotto but, like you, don’t always have the time to watch over it. This is the perfect solution! What a beautiful weeknight or entertaining meal. I am with you on chicken thighs — the BEST part of the bird. This looks astoundingly good! This is my favorite kind of dinner – easy, comforting and delicious. Adding pesto and parmesan is such a great touch – love it! 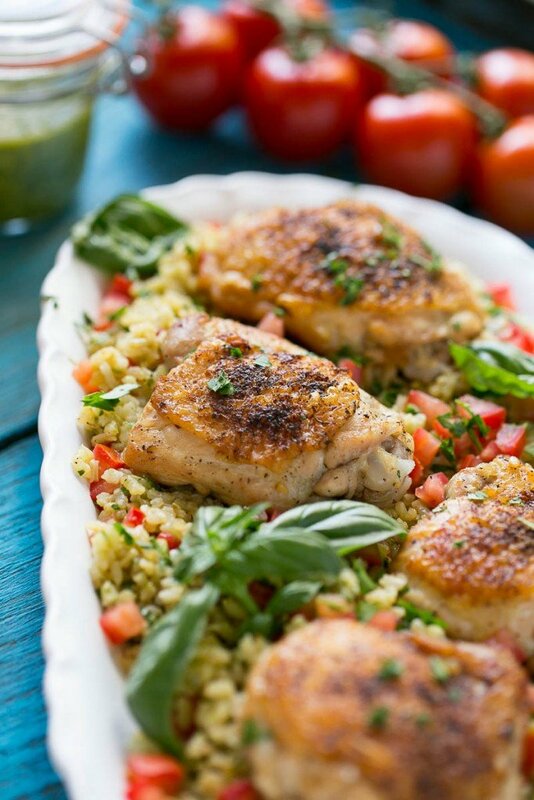 Love those easy but so delicious and full of flavor chicken dinners! Love one pot meals! Your recipe is so simple and I bet super delicious! Love the pesto in the rice. Such beautiful photos. I love the colors in this dish. I can just imagine all the flavors. Thanks for the great tip about stirring in the pesto and tomato at the end to preserve the colors. Can’t wait to try this. Great combination of flavors, I’m looking forward to giving this a try – pinned!